Tables and figures are great tools to present sizeable amounts of complex data in a space-saving, easy-to-understand way. Decide when to use a table, a figure, or text depending on the type of data you need to present and what your journal guidelines recommend. Follow these guidelines for framing table and figure and titles, representing symbols within tables and figures, and ensuring that your artwork is clutter-free and visually appealing. 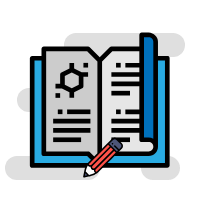 Several studies, journal guidelines, and discourses on scientific writing1-10 affirm the critical role that tables, figures, and graphs (or display items) play in enhancing the quality of manuscripts. Scientific tables and graphs can be utilized to represent sizeable numerical or statistical data in a time- and space-effective manner. Readers are often drawn towards tables and figures, because they perceive it as easy-reading, as compared to reading a verbose account of the same content. They rightly assume that these display items will provide them with a larger amount of information in a shorter time span. At the manuscript screening stage, these display items offer reviewers and journal editors a quick overview of the study findings, and once the paper is published, they do the same for readers (some of whom look only at these display items and not at the rest of the manuscript7). However, tables and figures only add value to the format of a research report, if they are brief yet sufficiently informative. These visual elements help authors present detailed results and complex relationships, patterns, and trends clearly and concisely;1-8,11,13,14 reduce the length of the manuscript;3,5,13,15 and enhance readers’ understanding of the study results.11,12 Therefore, these tools are integral to the format of a research paper because, if clear and well-organized, they speed up the comprehension and interpretation of the study’s findings. But while well-presented tables and figures in research papers can efficiently capture and present information, poorly crafted tables and figures can confuse readers and impair the effectiveness of a paper.16 To help authors get the balance right, this article presents some essential guidelines to the effective use of tables and figures in research papers. First, check out what your target journal has to say on the issue. Some journals limit the number of tables and figures and also have specific guidelines on the design aspects of these display items. Finally, follow the best-practice guidelines outlined in section 3 and review the examples presented in section 4 of this paper to ensure that your tables and figures are well-designed. 2. Refer, but don’t repeat: Use the text to draw the reader’s attention to the significance and key points of the table/figure, but don’t repeat details.5,12,16,19,21,22 So for example, you could highlight your main finding (e.g., “We found that the treatment was effective in only 24% of the cases, as shown in Figure 1”), but don’t repeat exact values (e.g., “As Table 2 shows, 32% of the subjects chose Option 1, 12% chose Option 2, 10% chose Option 3, and 46% chose Option 4”). This defeats the very purpose (efficiency and clarity) of having a table or figure. 3. 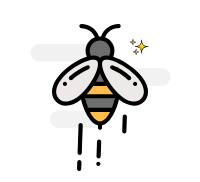 Be consistent:6,9,12,17 Ensure consistency between values or details in a table (e.g., abbreviations, group names, treatment names) and those in the text. 4. Give clear, informative titles:16,17 Table and figure titles should not be vague9,19 but should concisely describe the purpose or contents of the table/figure and should ideally draw the reader’s attention to what you want him/her to notice17 (e.g., Advantages and disadvantages of using sleep therapy with patients suffering from schizophrenia). Also ensure that column heads, axis labels, figure labels, etc., are clearly and appropriately labelled. 1. Combine repetitive tables: Tables and figures that present repetitive information will impair communication rather than enhance it.8,12 Examine the titles of all your tables and figures and check if they talk about the same or similar things.8 If they do, rethink the presentation and combine or delete the tables/graphs. Do you have any questions related to writing and publishing your research paper? 2. 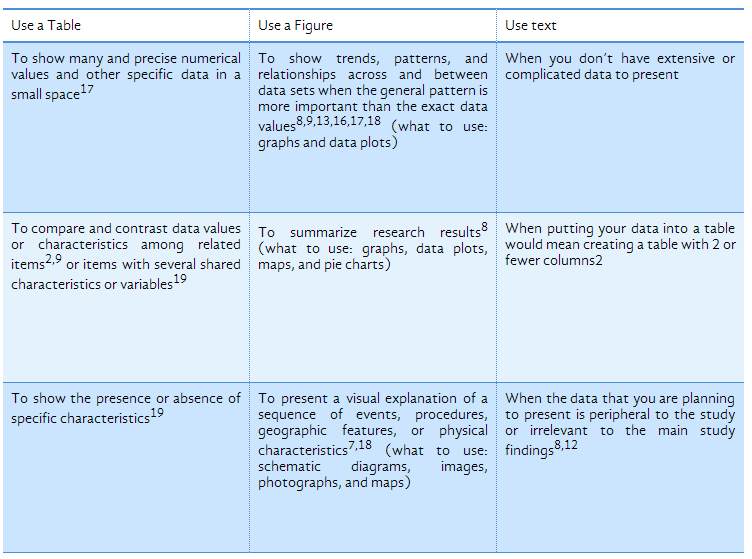 Divide the data:7 When presenting large amounts of information, divide the data into clear and appropriate categories and present them in columns titled accurately and descriptively. 4. De-clutter your table: Ensure that there is sufficient spacing between columns and rows7 and that the layout does not make the table look too messy or crowded. 2. Use legends to explain the key message:25 Figure legends are pivotal to the effectiveness of a figure. Use them to draw attention to the central message as well as to explain abbreviations and symbols. This section presents one example each of a well-prepared table and a well-designed figure. 1. The title clearly describes what the table is about. 2. The column heads are descriptive and clearly indicate the nature of the data presented. 3. The data is divided into categories for clarity. 4. It is self-contained and can be understood quite well even without reference to the entire paper. 5. Superscript letters and notes are used to offer additional, clarifying information. 6. Sufficient spacing is present between columns and rows; the layout is clean, and the font is legible. The informative title that immediately tells the reader what to expect in the graph. The axes are labeled clearly. The key clearly identifies what each element in the graph stands for. A figure legend at the bottom draws the reader’s attention to the graph's key points. A note at the bottom acknowledges the source. The graph is 2-dimensional, with no clutter. Figures and tables, or display items, are powerful communication tools—they give your manuscript a professional feel, attract and sustain the interest of readers, and efficiently present large amounts of complex information.7 Moreover, as most journals editors and reviewers will glance at these display items before they begin a full reading of your paper, their importance cannot be overemphasized. 1. Council of Science Editors. Journal Style and Format. In Council of Science Editors(Eds. ), Scientific Style and Format: The CSE Manual for Authors, Editors, and Publishers, 7th Edition (p. 460). Reston, VA: Rockefeller University Press, 2006. 2. American Psychological Association. APA Editorial Style. In Publication Manual of the American Psychological Association,5th Edition (pp. 147–201). Washington, DC: American Psychological Association, 2001. 3. International Committee of Medical Journal Editors. Uniform Requirements for Manuscripts Submitted to Biomedical Journals: Writing and Editing for Biomedical Publication [Accessed: Aug 8, 2011] Available from: http://www.ICMJE.org. 4. Cooper RJ, Schriger DL, Wallace RC, Mikulich VJ, Wilkes MS. The Quantity and Quality of Scientific Graphs in Pharmaceutical Advertisements. Journal of General Internal Medicine, 2003; 18: 294–297. 5. Durbin CG Jr. Effective Use of Tables and Figures in Abstracts, Presentations, and Papers. Respiratory Care, 2004; 49(10): 1233–1237. 7. Springer. The Importance of Figures and Tables. [Accessed: Aug 8, 2011] Available from: http://www.springer.com/authors/journal+authors/training?SGWID=0-1726414-12-837813-0. 8. Clark JC. Effective Tables and Figures. [Accessed: Aug 8, 2011] Available from:http://ion.uwinnipeg.ca/~clark/research/comm/C12_FIGU.pdf. 9. McMillan VE. Using Tables and Figures. In Writing Papers in the Biological Sciences (pp. 30–50). New York: St. Martin’s Press, 1988. 10. Smith LD, Best LA, Stubbs DA, Archibald AB, Roberson-Nay R. Constructing Knowledge: The Role of Graphs and Tables in Hard and Soft Psychology. American Psychologist, 2002; 57(10): 749–761. 11. Purdue Online Writing Lab. APA Tables and Figures 1. [Accessed: Aug 8, 2011] Available from: http://owl.english.purdue.edu/owl/resource/560/19/. 12. SAGE Publications. How to Get Your Journal Article Published. [Accessed: Aug 8, 2011] Available from: http://www.uk.sagepub.com/journalgateway/files/how_to_get_published.pdf. 14. Schriger DL, Sinha R, Schroter S, Liu P, Altman D. From Submission to Publication: A Retrospective Review of the Tables and Figures in a Cohort of Randomized Controlled Trials Submitted to the British Medical Journal. Annals of Emergency Medicine, 2006; 48(6): 750–756. 15. Institute of Food Technologists. Author Guidelines. [Accessed: Aug 8, 2011] Available from:http://www.ift.org/Knowledge-Center/Read-IFT-Publications/Journal-of-Food-Science/Authors-Corner/Author-Guidelines.aspx. 16. The University of ReadingStatistical Services Centre. Informative Presentation of Tables, Graphs and Statistics. [Accessed: Aug 8, 2011] Available from: http://www.reading.ac.uk/ssc/n/resources/Docs/PresentationOfTablesGraphsAndStatistics.pdf. 17. Hoagland N. Using Tables and Figures in an Academic Research Paper. [Accessed: Aug 8, 2011] Available from: http://polaris.umuc.edu/~nhoaglan/COMM600/Tables%20and%20Figures.pdf. 18. Author Aid Resource Library. Tables and Figures: Some Basic Advice. [Accessed: Aug 8, 2011] Available from:http://www.authoraid.info/resource-library/authoraid-workshop-on-research-writing-march-2011/Nepal-RM_01a-Tables%20and%20Figures-minus%20photos.ppt/at_download/file. 19. Northwestern’s Online Writing Resources. Visual Communication: Document Design, Figures, and Tables. [Accessed: Aug 8, 2011] Available from: http://nuwrite.northwestern.edu/communities/design/docs/engineering-design-and-communication-principles-and-practice/chapter_20.pdf. 20. Marine Ecology Progress Series. Guidelines for MEPS Authors. [Accessed: Aug 8, 2011] Available from: http://www.int-res.com/journals/meps/guidelines-for-meps-authors/. 21. BMJ Publishing Group. The Essentials of BMJ Style. [Accessed: Aug 8, 2011] Available from:http://resources.bmj.com/bmj/authors/bmj-house-style. 22. The Geological Society of America. Geology Guidelines. [Accessed: Aug 8, 2011] Available from: http://www.geosociety.org/pubs/geoguid6.htm. 23. Wiley-Blackwell. Author Services: Electronic Artwork Guidelines. [Accessed: Aug 8, 2011] Available from: http://authorservices.wiley.com/bauthor/illustration.asp. 24. Wiley-Blackwell. Electronic Artwork—An Introduction. [Accessed: Aug 8, 2011] Available from: http://authorservices.wiley.com/electronicartworkguidelines.pdf. 25. PLOS Biology. PLOS Biology Guidelines for Authors. [Accessed: Aug 8, 2011] Available from: http://www.plosbiology.org/static/guidelines.action#figures. 26. Deagle BE, Gales NJ, Evans K, Jarman SN, Robinson S, et al. 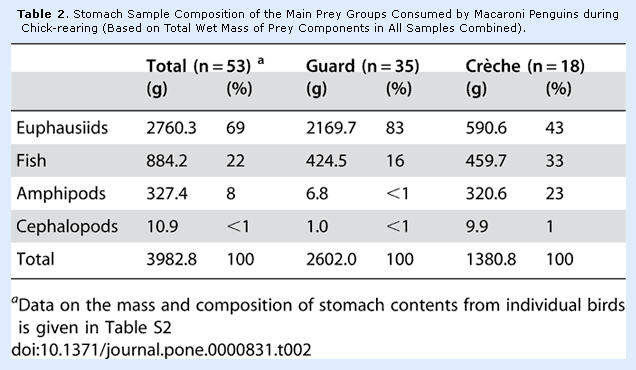 Studying Seabird Diet through Genetic Analysis of Faeces: A Case Study on Macaroni Penguins (Eudypteschrysolophus). PLoS ONE 2007; 2(9): e831. 27. 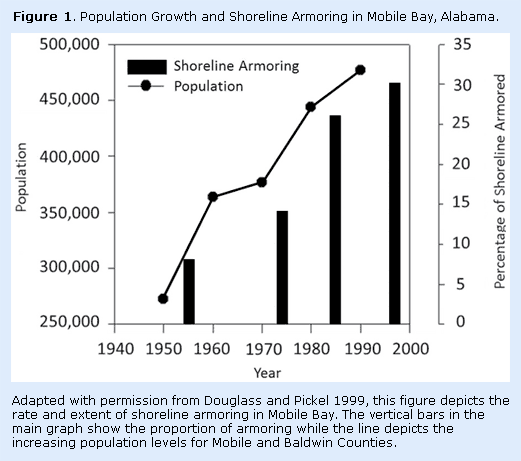 Cyphers SB, Powers SP, Heck KL Jr, Byron D. Oyster Reefs as Natural Breakwaters Mitigate Shoreline Loss and Facilitate Fisheries.PLoS ONE2011; 6(8): e22396.